Piriformis Syndrome is a result of pressure applied to the sciatic nerve by the piriformis muscle. The pain usually runs from the buttocks down to the back of the thigh. Incorrect form or improper gait often leads to tightness and inflexibility in this muscle. This condition occurs more frequently in women than men. The piriformis muscle is a small, tubular muscle that originates at the internal surfaces of the sacrum, inserts at the superior border of the greater trochanter of the femur, and leaves the pelvis by passing through the greater sciatic foramen. The muscle assists in laterally rotating the hip joint, abducting the thigh when the hip is flexed, and helps to hold the head of the femur in the acetabulum. When the muscle becomes tight, it puts pressure on the underlying nerve, causing pain similar to sciatica. The pain usually starts in the mid-buttocks region and radiates down through the hamstrings. Incorrect form or gait while walking or jogging. Weak abductor muscles and/or tight adductor muscles. Pain along the sciatic nerve. Pain when climbing stairs or walking up an incline. Increased pain after prolonged sitting. Chronic pain will result if left untreated. The tight muscles could also become irritated causing stress on the tendons and the attachments. During rehabilitation, a gradual return to activity and continued stretching of the hip muscles is essential. Starting with lower intensity or duration when returning to activities is wise. Identifying the factors that initiated the problem is also important. Strengthening the abductor muscles and increasing the flexibility of the adductors will help to alleviate some of the stress and prevent the piriformis from becoming tight. Maintaining a good stretching regimen to keep the piriformis muscle flexible will help, while dealing with the other issues. Piriformis syndrome seldom results in long-term problems when treated properly. Rarely, an anti-inflammatory injection or other invasive method may be required to alleviate the pain and tightness. 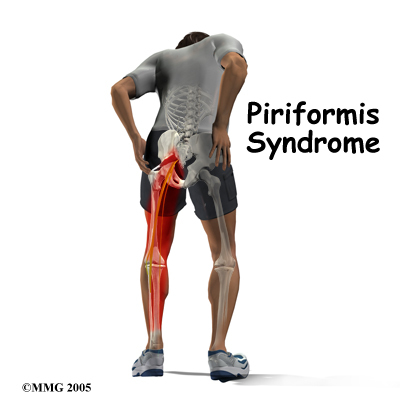 Call (+65) 6471 2674 (24 Hour) to make an appointment to see our doctor to treat piriformis syndrome today.